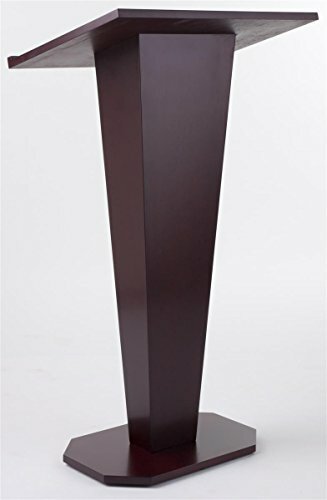 This is a stylish mahogany podium that will command attention to the presenter that stands behind it. Crafted from plywood, this lectern has a mahogany veneer that emulates solid wood construction. It has a Large 23-5/8 x 17-inch reading surface with a 3/8-inch lip that holds notes so that speakers can make hands free presentations. The wide base provides stability while the adjustable feet have rubber pads that protect the floor surface from damage. Dimensions: overall: 43-inch (H) x 23-5/8-inch (W) x 18-inch (D) reading surface: 23-5/8-inch (W) x 17-inch (D) reading surface height: 40-inch (H) lip thickness: 3/8-inch (H) base: 19-3/4-inch (W) x 13-inch (D) weight: 28.5-Lbs. Features a 3/8-inch lip for holding notes and enabling hands-free presentation. Mahogany veneer gives the appearance of expensive solid Wood. Includes feet levelers for stability and preventing damage to the floor surface.